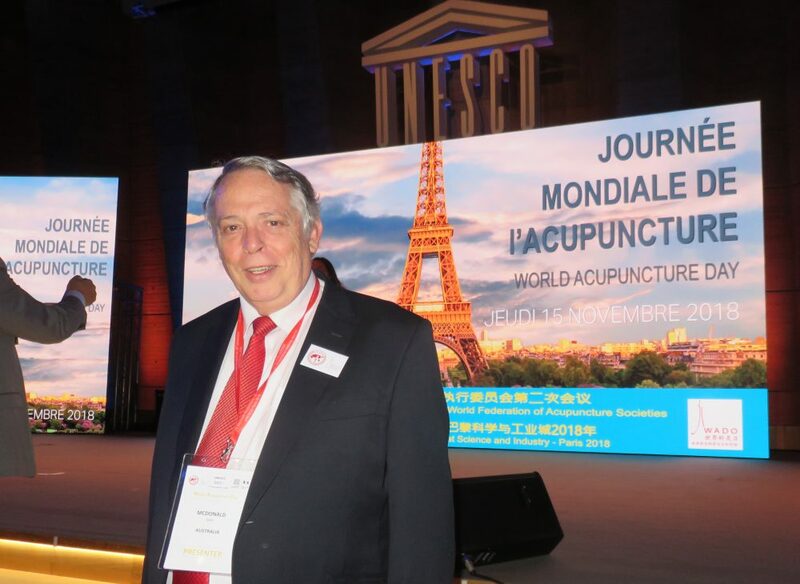 Following World Acupuncture Day, John was again an invited speaker at the World Scientific and Cultural Dialogue on Acupuncture was held, also in Paris, at the City of Science and Industry. In July John presented a workshop in Auckland, co-sponsored by Acupuncture Now Foundation New Zealand and Neuromagnetics. In April 2018 John McDonald was keynote speaker for the American Academy of Medical Acupuncture Annual Symposium in Kansas City, Missouri. Lecturing for the Doctor of Acupuncture and Oriental Medicine programme at the Academy of Chinese Culture and Health Sciences in Oakland, California in April 2018 (with Misha Cohen, Jennifer Williams and Phil Settels). Catching up with old friend Su Zhihong, the best English-Chinese translator for Traditional Chinese Medicine that Beijing ever had. Book promotion and lecture tour 2001 at London College of Traditional Acupuncture and colleges and book suppliers at Camden and Covent Garden in London, Royal Leamington Spa, East Grinstead and Oxford. The Acupuncture Now Foundation Executive met face-to-face for the first time at SAR conference, Harvard Medical School, Boston, October 2015: Mel Hopper Koppelman (Executive Vice-President, ANF), Angelica Kokkalis (Han Foundation), Matthew Bauer (ANF President), John McDonald (ANF Vice-President) and Brenda Golianu (Stanford).